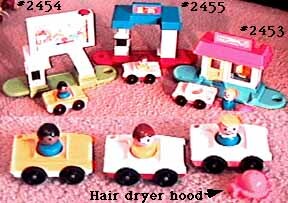 Description: This is an assortment of three different individually packaged Original Little People sets that were sold to retail stores for resale. Each set in this assortment includes a small oval-shaped base with a hole on one end and a peg on the underside of the other end. The hole and pegs allow the three bases to interlock together. Designed for children ages 2 to 6 years old. Each set in this assortment was sold in a 12-1/4" long, 8-1/4" high, 3-3/4" deep display box.